On September 17th, we hosted a preparation event for Garage48 Pärnu. Maarika Susi, one of the organizers of Garage48, and three women, who have been participating in Garage48 during the years (Kei Karlson, Ülane Vilumets, Diana Poudel), shared their experiences and gave quite a few helpful tips for people interested in taking part in Garage48 Pärnu. Here are the tips they gave the audience and a few random thoughts worth thinking about. Presenting your idea is more difficult than actually building it. So do be prepared! Rehearse your pitch several times and learn it by heart. For example Diana suggested taking a video of yourself while practising. Giving a good pitch might get you a team, even if your idea isn’t the most greatest one ever. On the other hand, you can have a wonderful idea, but if you lack presentation skills, this might not be enough. When at Garage48, tight schedule is super important. Don’t spend hours arguing over which programming language to use. You’ll waste valuable time that should be spent on something more important. A versatile team is the basis of a successful Garage48 weekend. It’s well worth coming up with a good name for your project beforehand. Don’t forget to do a little research. Has someone else come up with a similar idea? Is there actually a problem that needs solving? Where will the funding come from? Etc. Garage48 event is just the beginning of your new project, the real work on it begins on the following day. And be prepared for the fact that if you really want it to work, you have to dedicate yourself 100%. This will most likely involve quitting your daily job. Don’t go into the start-up business just for the sake of it. For example, Ülane, the woman behind Like A Local Guides and Traveller Tours, told us she wants others to have the travelling experience she has had. Diana had a problem finding a baby sitter and she took matters into her own hands while creating Lastehoid.net at Garage48. Stay true to yourself and your idea, ask help and feedback, connect and have fun! All in all, if you have an idea, but you don’t have the people around you to execute it with, go to Garage48 Pärnu. If you don’t have an idea, but want to have fun, make lots of new connections and get to know the start-up scene, also go to Garage48 Pärnu It’s most likely that you can be useful for a team, whether that be programming, marketing, writing press releases or designing (developers and marketing people are especially needed). If you’re afraid you’re not on the most advanced level in your field, don’t worry, because the organizers take care of balancing teams and have technical as well business mentors on site, who will help everyone out. 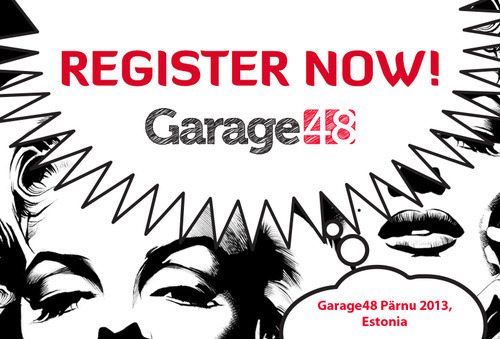 Our next prep event for Garage48 will be held on October the 1st. Keep an eye on our Facebook page and we’ll let you know about the details.